All module results are stored on localhost and are part of APT2's Knowledge Base (KB). The KB is accessible from within the application and allows the user to view the harvested results of an exploit module. APT2 uses the default.cfg file in the root directory. Edit this file to configure APT2 to run as you desire. 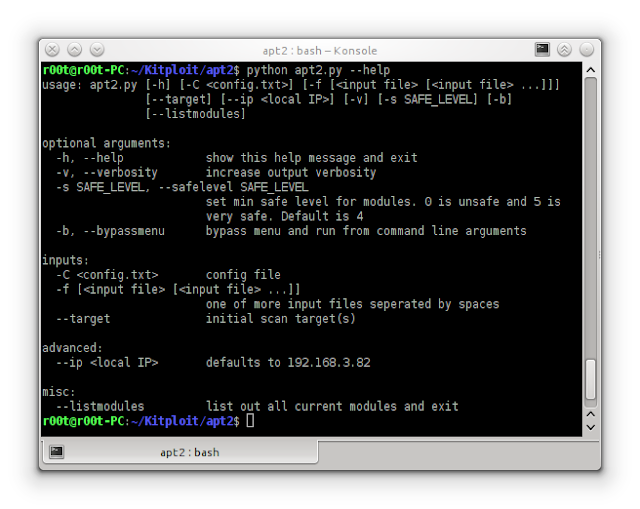 Configure NMAP scan settings to include the target, scan type, scan port range, and scan flags. These settings can be configured while the program is running. Configure the number of the threads APT2 will use. Safe levels indicate how safe a module is to run againsts a target. The scale runs from 1 to 5 with 5 being the safest. The default configuration uses a Safe Level of 4 but can be set with the -s or --safelevel command line flags.